The victory of Turkey's ruling Justice and Development Party (AKP) in a November 1 snap election took most informed observers by surprise. Less than five months after losing its parliamentary majority for the first time in a regularly scheduled legislative election in June, the AKP captured 317 of 550 seats on this second try, securing President Recep Tayyip Erdoğan's grip on power through at least 2019. How did this turnabout happen? By all accounts, public antipathy toward President Erdoğan reached an all-time high this year. After eliminating secularist control of the military and judiciary under the guise of liberal political reforms during the AKP's first decade in power, Erdoğan went on to "single-mindedly concentrate power in his own hands," writes Svante E. Cornell, research director of the Central Asia-Caucasus Institute at Johns Hopkins University's School of Advanced International Studies, in the Middle East Quarterly. 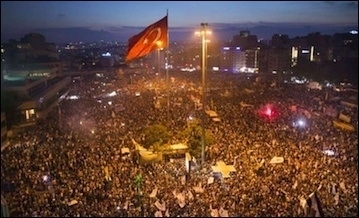 Demonstrators gather in Taksim Square on June 15, 2013. Erdoğan's growing autocratic tendencies and ever more blatant corruption encountered intense opposition from varied sectors of Turkish society. 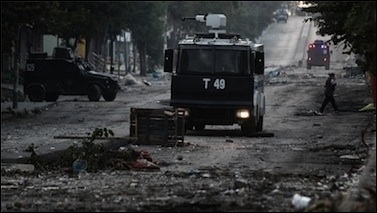 The massive Gezi Park protests in the summer of 2013 signaled a level of popular discontent hitherto unseen in Turkey. As Damla Aras illustrates in the Middle East Quarterly, much of the diplomatic corps objected loudly to Erdoğan's excesses, as did a stream of defectors from the ruling party. The most damaging pushback came from the Gülenists, a moderate, ostensibly non-political Islamist movement that acquired enormous influence within the Turkish bureaucracy in recent decades and had been quietly supporting the AKP since its rise to power. 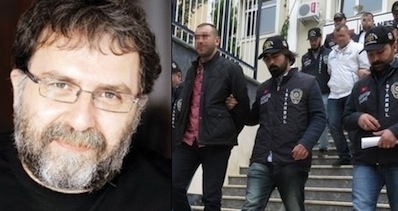 Police officers, judges, and others with Gülenist sympathies spearheaded a December 2013 corruption probe leading to the arrest of the sons of three government ministers and leaked wiretap recordings implicating Erdoğan's family. Ekrem Dumanli, editor-in-chief of the flagship Gülenist daily Zaman, greets supporters outside an Istanbul courthouse in December 2014. Erdoğan struck back with a purge of Gülenists from government and crackdown on its media and financial assets. The divorce led MEF Shillman-Ginsburg Fellow Efraim Inbar to speculate that "more conservative secular elements on the Turkish political spectrum might build an alliance with the influential Gülens to remove Erdoğan." After serving since 2003 as prime minister, Erdoğan was elected president in 2014 with 52 percent of the vote against a split opposition. As MEF fellow Burak Bekdil explains in the Middle East Quarterly, he then aspired to transform this largely ceremonial position into a Russian-style super-presidency. For this, the AKP would need to win 330 seats in parliament so as to rewrite the constitution – a number that Erdoğan repeated endlessly in the lead-up to the June 2015 elections. To the shock of many, the AKP won only 258 seats in the election, not enough even to form a government. After refusing to share power with the opposition in a coalition government, Erdoğan called new elections to replace the hung parliament. Calling the June election results a "mistake" that the Turkish people had to "correct" in a new vote, he set about changing their minds. MEF President Daniel Pipes argues that the Islamist grip on power in Turkey is so entrenched that the "the number of AKP seats in parliament hardly matters ... Erdoğan will do what it takes, legally or illegally, to become the new sultan." 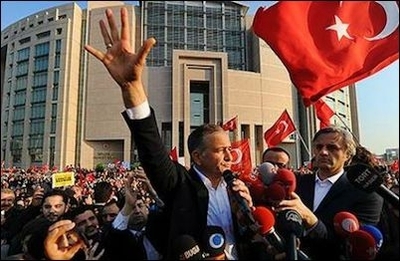 Having famously said when he was mayor of Istanbul in the 1990s that democracy is like a trolley – "you ride it until you arrive at your destination, then you step off," the November election would simply determine whether it was time to abandon this means to an end. In any event, the AKP increased its percent of the popular vote from 41 percent to 49 percent. What accounts for this change? Daniel Pipes argues that the results themselves are a prima facie indication of likely fraud. "That about one in nine voters switched parties defies reason," he remarked, pointing out that public opinion polls in the weeks and months ahead of the vote showed no substantial increase in public support for the AKP (see table below). 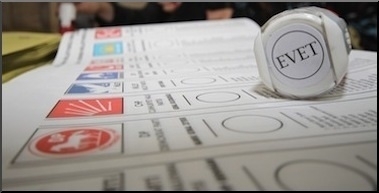 While the opposition-dominated civil society organization Oy ve Ötesi (Vote and Beyond) found little hard evidence of fraud at the minority of polling stations it monitored, manipulation of the numbers at unmonitored stations would be simple to effect using Elector Record System (SEÇSİS) software. According to Burak Bekdil, Erdoğan's decision to dramatically ramp up his regime's crackdown on freedom of expression in the aftermath of the June elections had a major impact on the vote. In the 226 days following Erdoğan 's election as president last year, 236 people were investigated for insulting him, including some of the country's leading media personalities. Moreover, the government's media crackdown paralleled efforts by pro-Erdoğan street thugs to intimidate those who remained unrepentant, notes Bekdil (whose own newspaper, Hurriyet, was attacked in September by hundreds of club-wielding demonstrators led by AKP MP Abdurrahim Boynukalin). Erdoğan, who as MEF Shillman-Ginsburg Fellow Stephen Schwartz notes has "a magnificent capacity for judging the mood of the public," understood that the AKP needed to attract votes from nationalists and moderate Kurds in order to regain its parliamentary majority, and that violence was the best means of achieving this. The Turkish electoral campaign was "characterized by too much violence and fear," said a monitoring delegation from the Parliamentary Assembly of the Council of Europe. In what MEF Wax Family Fellow David P. Goldman called a "transparent maneuver" to "elicit support from Turkish nationalists" (a strategy also discussed by Daniel Pipes), Erdoğan scrapped his government's fragile ceasefire with the PKK and launched major military operations against it. In addition, the unprecedented scale of the violence "wore down Kurds with more loyalist sentiments to Turkey," suggests Burak Bekdil. This was particularly true after a twin suicide-bomb attack on a Turkish-Kurdish peace demonstration in Ankara killed 97 and injured nearly 250 people. Whatever the cause, the election returns indicate that the AKP gained about 4.1 percent of the vote at the expense of the Nationalist Movement Party (MHP) and another 1.4 percent at the expense of pro-Kurdish Peoples' Democratic Party (HDP). Although Turkey is uniquely endowed with a political heritage conducive to democracy, as the distinguished historian Bernard Lewis explained in an early Middle East Quarterly article, the extension of the AKP's mandate until at least 2019 may well extinguish what's left of it. "Foreign capitals need to prepare for the unpleasant likelihood of a rogue dictatorship in Turkey," concludes Daniel Pipes.